I finally got a chance to drop by one of our new Trader Joe's we have here in Atlanta. It's not quite a cool as the one I remember from San Francisco in the late 90's but I'm still glad we got them. 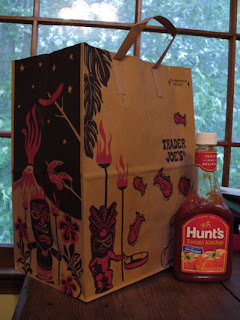 I picked up some snacky things for work and some cool soap for home and got to put it all in a nifty Tiki Grocery bag. I had read about them on the Tikievents mailing list a month or so ago and was glad to find they had them here in GA (and still had some left.) I may have to go back and get more. I liked the No Salt Added ketchup. Maybe that's because you'd already over-salted your fries. I didn't like the stuff... needed salt.